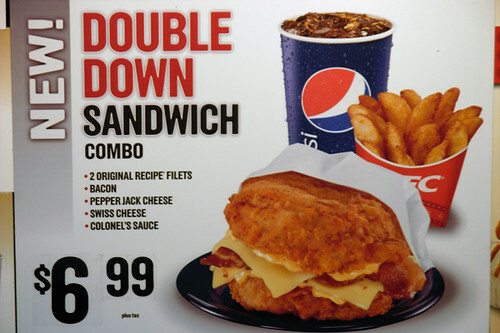 KFC's Double Down will not be coming to Canada anytime soon. As per usual the Canadian governing food agencies have probably had a word with KFC about ever increasing health care costs. And they refuse to let Canadians get out of hand at the dinner table. It seems the Double Down discussion must have ended with "there will be no waddling in Canada" because KFC has opted to launch or unleash rather this cardiac nightmare onto Americans only... You know, the land of the free and the home of the brave...I say this with the utmost respect, because so many will need it " God Bless America."